Tinted Windows – Your New Favorite Supergroup. Tinted Windows is not your ordinary rock super group. 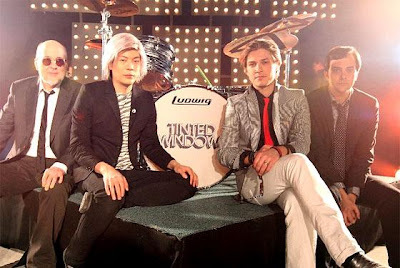 An all-start band, the ensemble consists of guitarist James Iha, previously of The Smashing Pumpkins, singer Taylor Hanson of Hanson, bassist Adam Schlesinger of Fountains of Wayne and Ivy, and Bun E. Carlos of Cheap Trick. Their self-titled release is clearly this year’s finest example of the lost art of Power Pop; bringing back the days when Cheap Trick and Elvis Costello ruled the airwaves and sold out arenas. I was lucky enough to catch the band before one of their shows, which can be quite a challenge to pull together with the members’ busy schedules. “We have a master calendar and when there’s an empty spot, here we are” says drummer Bun E. Carlos who had the day off from his current Cheap Trick / Def Leppard/ Poison tour.